Please beware of counterfeit Bakki House claiming to come from Momotaro Koi Farm. They have the same look, but will not get the same results. Here is a link to Momotaro Koi Farm's website for reference and scroll down to attention Koi Hobbiests. The bacteria house creates a very large amount of bacteria which makes the water live, and maintains water quality exceptionally well. The bacteria house has many crevices which creates a very large surface area in comparison to the other filtration media, making the bacteria count phenomenally high. The material is the same as the old type but, the new one has a hole in the center of the Bacteria House which creates much more Surface area! Moreover, the hole in the center lets even more bacteria to colonize making the efficiency of the media that much more effective. Adhesion of bacteria appears clearly in about three weeks after installation of the bacteria house, and should start to notice the changes in water quality. The bacteria house creates static electricity-action, which in turn decomposes the detritus making the pond have better clarity due to the high levels of bacteria. 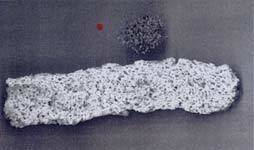 A bacteria house takes out abundant far-infrared rays. 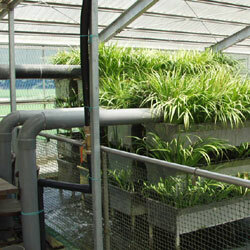 Consequently, the cluster of water becomes small and taking in of youzai oxygen goes up. It is the combined use with Momotaro Air Explosive Shower, and a wonderful effect is demonstrated. A fish eats food well at the same time the activity of bacteria goes up. Usually, some molecules of water solidify and water exists. so that the soul of the molecule is called cluster and a cluster is small -- water -- living -- living -- it is . It can be said that far-infrared radiation is high, so that it is close to 100%. The bacteria house of a maximum of 324 L can be installed in one step of Momotaro Air Explosive Shower. Of course, even if I have you use it for the conventional filtration tub, it is preeminent for an effect. 10kg(22lbs.) is rated for 500gallons.